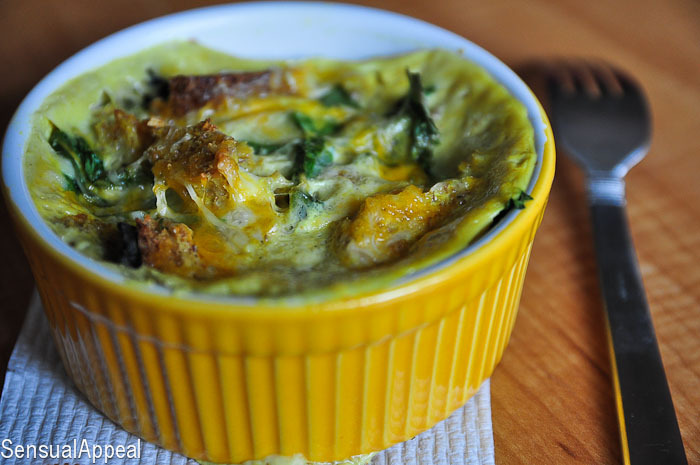 This Spinach & Egg Strata is a healthy single-serve breakfast recipe that is so comforting and delicious – it’s certainly one of my favorite strata recipes! As you might have noticed my favorite kinds of recipes to do are desserts, snacks, and breakfast. Sweets are a given, even if they aren’t always the easiest thing in the world to make (but oftentimes they are), but breakfast food is just another meal that I simply adore. Although I don’t eat breakfast food at breakfast necessarily. I don’t know, is that weird? I never feel like spending so much time in the morning to prepare my breakfast. Since I work out on empty stomach right as I wake up, when I’m done and sweaty, I want to be able to eat right now. I don’t have time to make eloquent baked oatmeals and eggs. My post-workout breakfast is usually a delicious protein shake or overnight oats. Sometimes also a parfait, because those are quick to make too. Truth is, breakfast food isn’t meant to be only eaten in the morning (or at least it isn’t in my world). You cannot tell me you wouldn’t love to eat pancakes or baked eggs at any time of the day, I know I would. And I DO! Don’t try telling me to do otherwise because I won’t listen anyway 😉 This recipe has been saved on my Pinterest board for a long time now. Probably since I started blogging back in March. Finally I have come around to it and made some (small) adaptations. Credit goes to Erin, fully. She rocks. 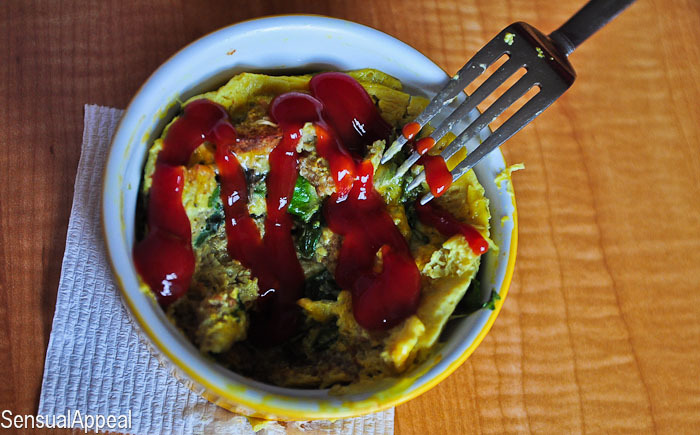 Ketchup on top… Keepin it classy. When I was eating it, I was transported back into childhood. I have no idea why, I’ve never eaten a strata before as far as I can remember. But when I put ketchup on it, some feelings of comfort took over. This warm casserole egg dish was so comforting, so warm and cozy… it would be perfect for a rainy day. Thankfully it’s cloudy today so it worked well. I could actually imagine my future as I was eating it, seeing my future kids enjoying this and asking me to make it for them on a cold rainy day, similarly as I used to ask my grandma or mom to make a dish I liked because it was comforting. It was a really bizzare feeling to be thinking these thoughts because I have never thought about my future that far ahead. Heck, I wasn’t even sure if I want kids! Ah… the power of food. What’s the one dish you had lately that made you feel nostalgic? I’m not really an egg person, but pretty pics! I’m the same way with breakfast, I always do my workout beforehand and never want to waste time preparing something elaborate! That said, breakfast for dinner is my jam. And that’s really the only time I eat savory breakfast foods too haha. This looks awesome! I am loving your high protein focus lately, I really am trying to add more protein in so your recipes are perfect. oh and delicious! I’m glad you like it Alex! 🙂 I love protein! looks great. will be giving this one a try. That looks great. what amazing colours.